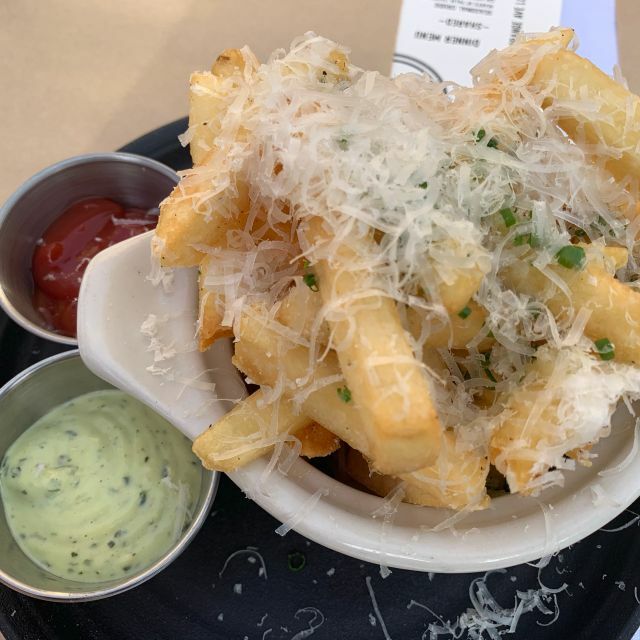 Ellie's is a Southern Italian inspired restaurant by chef & owner Jason Witzl located in the Alamitos Beach district of Long Beach. Understanding the value of curating ingredients grown and handled with care, Ellie’s features the products of an assortment of farmers, fisherman, and butchers unique in their methods. It was a bit breezy and cool so we sat indoors. The kitchen was loud, otherwise it was fine. Our food was very good though my pork hash which tasted great, hardly had any pork in it. Even so, I've been there before and will go again. The service is excellent. Cute "neighborhood" restaurant (literally in a residential neighborhood). I went with my Italian friend to try it out. All of the their pasta is made from scratch, but the are very small portions of pasta. My friend had the chittara promodoro (basically thin spaghetti) [$14], with meatballs [+$5]. It came with three good sized meatballs, but not enough pasta. 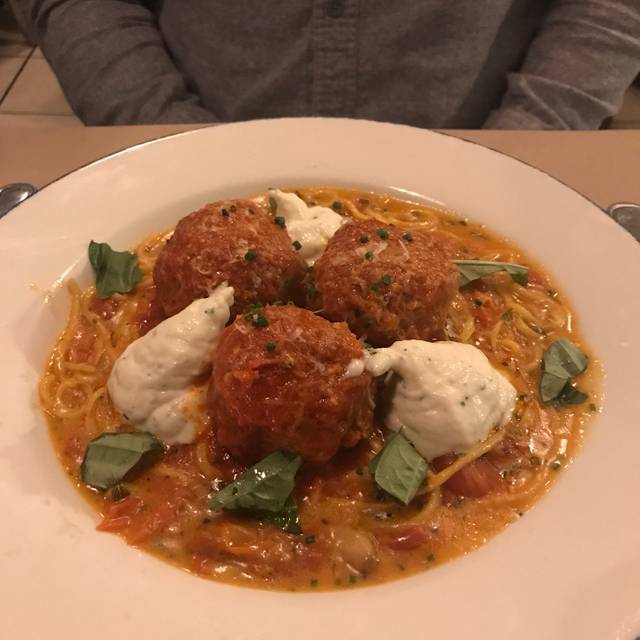 My friend said "the meatballs, as an addition, is supposed to accompany the pasta, not the other was around." I ordered lasagna [$18] and it was a good size portion, but it was served lukewarm, not hot. Our waitress asked if we wanted black truffle "oil" (that's what we both head) but it turns out to be very thinly sliced black truffle, which, surprisingly added no flavor. That was an additional $11/plate. We asked for table bread, which they don't serve. Our waitress said she could order sliced sourdough bread with butter if we like (isn't that table bread?). The bread came out after our meals and was toasted with a garlic butter and served with "pork butter" and a small portion of vegetables. There was two slices of sourdough cut in half - four small pieces of bread [$5]. We asked for additional bread to finish the butter and specifically ask for just sliced bread, not toasted. The 2nd order of bread came much quicker, however it was toasted and there were three small pieces [additional $2]. Both of our dishes were on the bland side - they were good but not bursting with flavor. After our server came to check if our order came out correctly, we never saw her again until we flagged her down for the check. For $140 dinner for two (before tip), I was a little disappointed in the service and food. We left feeling up charged on all the food items, which may have been part of the "bad taste" left with us. Parking (lack thereof) was a major issue, but we endured for the fantastic food! The veggies at this restaurant introduced my mouth to new flavors. Some of the best food I’ve ever eaten. Highly recommend! Delicious, fresh and innovative! I would highly recommend this wonderful gem in Long Beach. 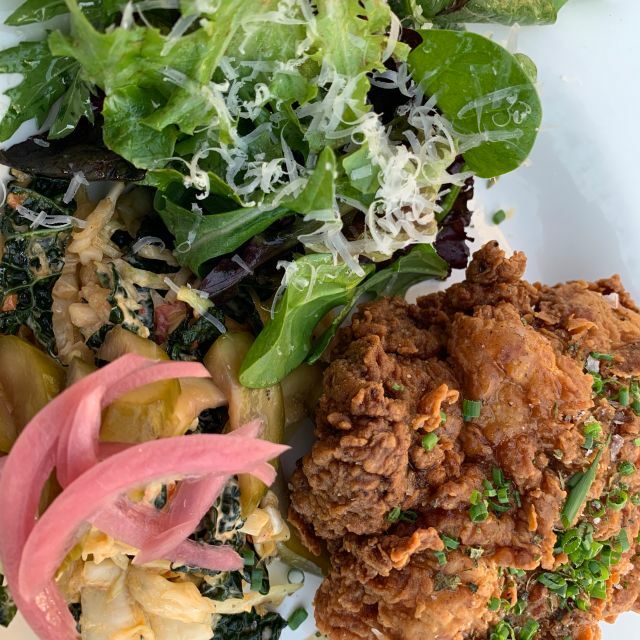 Ellie’s has become our new go to place for brunch, happy hour and dinner. you won’t be disappointed. I’ve been here twice now, and each time we’ve gotten a number of dishes—everything is absolutely delicious. The restaurant is amazing...food and staff were fantastic...the parking, however, was a nightmare. My husband spent over half an hour circling looking for a place to park. We will be back, but will taking an Uber next time. It was loud inside but very authentic. If you want a quiet atmosphere sit on the patio. Amazing food!! The only reason I say this, is we tried to express we were running tight due to our 2 year old daughter. We admit, this was not the best option on a hectic week to bring her. However, we felt as though because we had her with us, we didn’t get the service that would have warranted a higher rating. The food is exceptional, no doubt about it. However, the service made us seem like we were a nuisance to them. We will be back, and without our little one. Only to enjoy the food and hope it was a one night thing. Everything we ordered was delicious. Love this spot for both Brunch and Dinner. I really appreciate the thought that has gone into their wine list as well as the rest of the menu, I had an awesome Grenache Blanc, my friend ordered a really tasty Californian Albarino. Some days I dream of their bread and pork butter. It's a required stop when i'm in Long Beach. This was my first time dining at Ellies'. I was so happy to see they had outdoor seating for our brunch. It was a beautiful Sunday morning. We were seated immediately and given menus. The selections were great. Some usual standards and a really creative selection of additional dishes. But the best part was our server, Heather. Gracious, helpful and full of life she guided us through the menu making perfect suggestions for our terrific brunch. Thanks Heather, you made our day. We've been hearing of Ellie's for a while but had not made it there until this past weekend for brunch. From what I hear they are quite busy for dinner but brunch was absolutely dead - we got their when they opened at 10:30a and left a little before noon and it was barely starting to fill in. Food was AMAZING. I don't know of anywhere in LB where you can get this quality of food for this price. It's not cheap but only a few bucks more than a run of the mill breakfast joint but the food is worlds better. Best chilaquiles I've ever had, our other dishes were fantastic and everything on the menu sounded fantastic. $15 bottomless mimosas. Why there isn't a line around the block for brunch I have no idea. Will be our go-to brunch, not even a question. Food was tasty but very small portions. The Raviolo was just one big ravioli while the lasagna was 3" high and enough for 2! Fish special was small too. 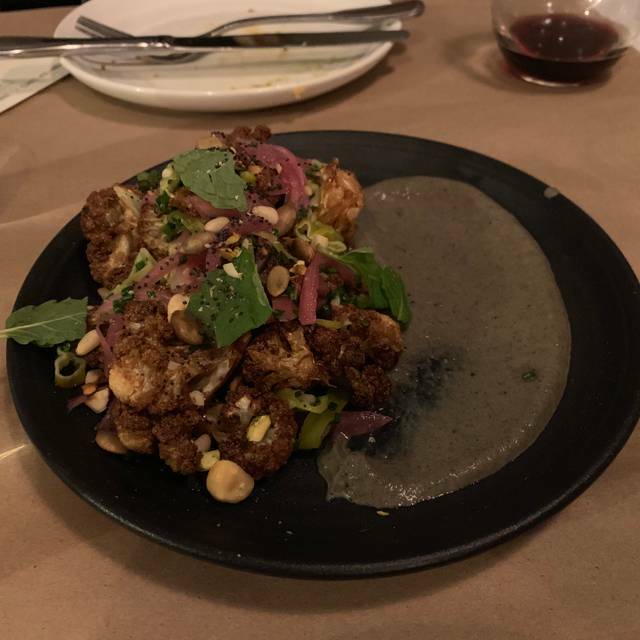 Best dishes were the Cesar salad (filled with veggies) and roasted cauliflower with eggplant puree! Had a reservation and the only table was outside - not too close to heaters. Finally moved inside which was so noisy, when we ordered the waiter couldn't hear us! Wine drinkers beware - $25 corkage fee! Great food and service. I had the butternut squash raviolo. It was very flavorful. once we found parking, food and service were fantastic. They do not honor reservations if you requested an inside table. The hostess was rude and unprofessional to everyone like we owed her an apology. More organization, less drama. We went to Ellie’s with a couple of friends for my wife’s birthday on Friday night. When we got there, there was a bit of a wait for an inside table, but the staff was wonderful about keeping us up to date about the status of our table. While we waited, we had a bottle of wine. The wine list is fantastic and they were really nice about letting us sample a wine we didn’t know about before we ordered a bottle. When we were seated, we ordered a LOT of food. It was hard to pick which thing to try, so we just tried it all. 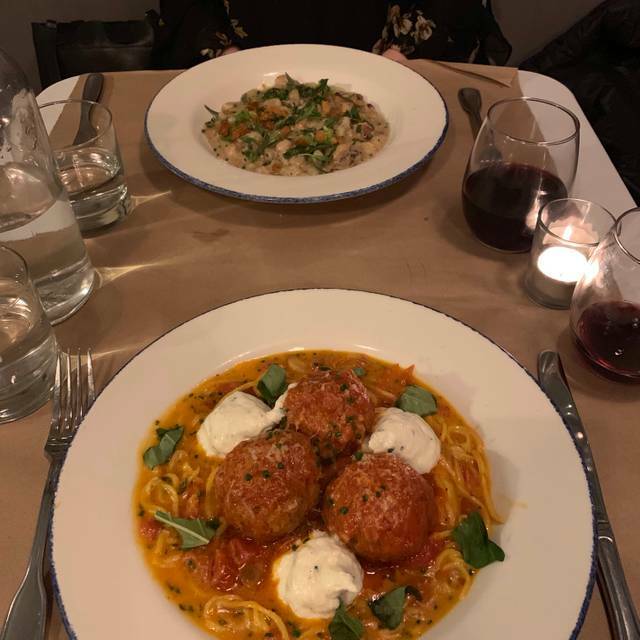 The risotto balls were out of this world. The gnocchi was to die for. Even the grilled bread was something g special. I can’t stress this enough: this was some of the best Italian food I have ever had in a restaurant. I have eaten a lot of high end Italian food, but this was on that level where you just never want to stop eating. The service was just as good as the food. The staff seemed to genuinely enjoy being there and were happy to help us out. Sometimes when the food is really good, the service drops off because they know you’ll be back no matter what. Not here. They made us feel welcome and excited to come back. Overall, I can’t say enough about this place or our experience. We will surely be back! Great place and delicious food. The staff was wonderful as well. The food and service were extraordinary. Friendly and professional staff, and not patronizing. We had a wonderful dining experience. Reserved a table using open table and it was confirmed for 9:30 Pm. Upon arrive they told me there was theee parties in front of me and one had been waiting for 45 minutes!!! Since this was the only restaurant available we said fine and were instructed to wait. Well we waited at a dive bar across the way because it was super cold. We were texted to come back yet we waiting again in the cold for 10 minutes before being seated. After we were seated the place was completely busy with horrible seating with no cushions. The server wasn’t great but the food was not all that! Overall I wish the food would have saved the day but not really. Would not recommend. They need to figure out their reservations or comp a drink or something. I think this could be the best food in Long Beach. Sooo wonderful to have an awesome restauranteur in the city in a great neighborhood restaurant! 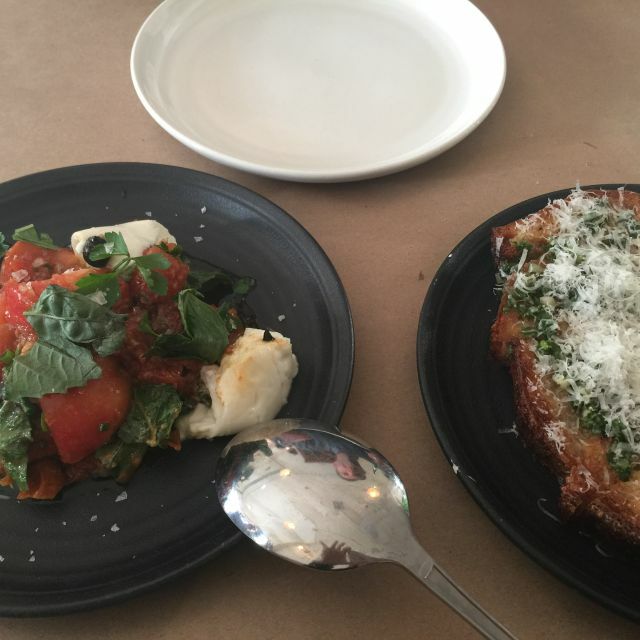 A fantastic neighborhood Italian restaurant. The pasta are amazing and the salads are enough for two. Short ribs were outstanding. Service is impeccable every time. Had the Valentine's Prix fixe with my fiancee. 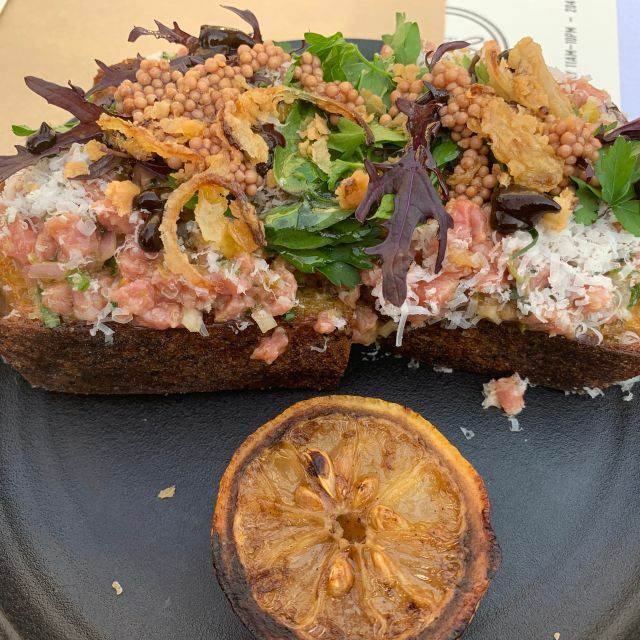 The meal started out strong with really good amuses and crudo, but everything after that fell flat. Was excited to try such a highly rated restaurant, esp the pastas, but left disappointed. The dining room was loud but not personally an issue. Service was good. High prices for a place whose interior and seating comfort are rustic to say the least. $25 corkage excessive for such ordinary ambiance, with crappy stemless glasses. Food was good, much better than its predecessor, At Last Cafe, but a bit overpriced. Nice neighborhood place with impossible parking (take Uber/Lyft) which charges like a high-end restaurant. Lower your corkage fee! Great new chef, in an unassuming spot in LB. We went there for brunch and liked it so much we made dinner res for the following wkend! So good, that I will eventually try every item on the menu. Yum!! Good food but the noise level is absolutely deafening. The background music is so loud you can barely hear the waiter ask for your order. I had a headache at the end of the meal. No one on the staff would take any steps to fix the problem. We love coming to Ellies's! Great service, wonderful creative recipes, such delicious combinations, friendly staff.